Our new grooming parlor is now fully open, run by Marita Rodgers who is an international grooming judge of the highest standard. 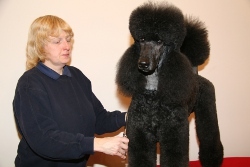 With over 40years grooming experience at the top level, presenting dogs for the show ring to the highest standard including Best in Show at Crufts on more than one occasion. Marita and the team are here to make your family pet look the picture. Don't be frightened by Marita's qualifications her prices are very competitive and for your dogs first visit a 20% discount will be given.